While a bodily function ended up getting approval, a bodily bounce did not. We're talking, of course, about iBoobs--the breast application Mystic Game Development ever created. (You can see a video demo here, if you're into that sort of thing.) The app lets you interactively jiggle a particular part of the female anatomy. Unfortunately, the only thing shaking on Apple's reviewer was his head. The program featured "inappropriate sexual content," Apple said, along with "obscene, pornographic, offensive, or defamatory content." "Watching an episode of Baywatch on TV shows a lot more than iBoobs," counters MGD Development Director John van der Burg. "Besides that, iBoobs is just a 3-D model and not even real," he says. Van der Burg's biggest beef was not being able to know in advance if the idea would fly. Had Apple answered his predevelopment inquiries, he says, it would have saved everybody some time. The same "offensive content" tag slashed Slasher's chances at App Store success. The simple program was cut from the catalog just one day after it was approved. "In a word, I was upset," says Josef Wankerl, the app's creator. "I tried contacting Apple to see if there was any way to resolve their concerns, but they never answered my e-mail." The seeming lack of consistency is what really twists the knife in Wankerl's side: Apps with comparable violence, he notes--such as one in which you use a broken beer bottle as a weapon--have been allowed into the store. Slasher, which only showed an image of a kitchen knife and sounded a scream when you shook it, was not. Non-kid-friendly content has been a contentious issue for Apple since the App Store's earliest days. Comic creator PJ Holden was one of the first to find this out when his Murderdrome digital comic was deemed too hot for the iPhone. "Aside from a few random voices suggesting that the material deserved to be banned, most people took the same reasonable view we did," Holden says. "Apple should really extend their ratings system for games onto the other applications that the App Store has." Holden has since used the engine built for the Murderdrome app to create more family-oriented comic applications. Still, he believes Apple isn't painting a picture of fairness with its current system--and that, he says, may be keeping talented artists from bringing their work into its platform. "Apple's 'reasonable judgment' seems to depend largely on an individual reviewer's judgment rather than any simple-to-gauge metric," he says. Sometimes, a rejection is issued for a simple reason: Apple doesn't want you competing with its own offerings. That's the exact scenario developer Alex Sokirynsky found himself in with his highly anticipated Podcaster application. Apple told Sokirynsky the app was too similar to iTunes and wasn't welcome on its virtual shelves. 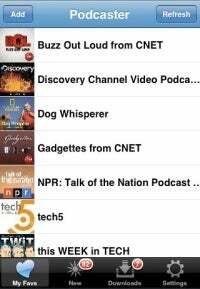 "Although my app does allow you to listen to podcasts like iTunes, it also allows you to download them directly to device, and that is something Apple does not offer," Sokirynsky points out. Sokirynsky ended up distributing his app to jailbroken phones via a backdoor distribution system. He also created a scaled-down version of the program called RssPlayer that got the App Store green light in late January. Ever wonder what Steve Jobs would have said about all the recent rebuffing? One developer did, and he decided to ask. 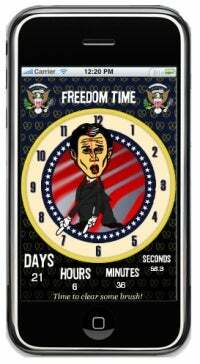 Apple put the kibosh on Alec Vance's presidential countdown clock, Freedom Time, before the counting ever kicked off. Inspectors said that the app--designed to tick down the final moments of the outgoing administration--defamed or demeaned political figures. "Defamation means making an untrue claim about someone in order to hurt their public standing," Vance wrote in a blog posting at the time. "This app makes no untrue claims whatsoever." Vance went on to e-mail Jobs directly to express his concerns. A day later, he says, he received the following response: "Even though my personal political leanings are Democratic, I think this app will be offensive to roughly half our customers. What's the point?" Vance got his answer, then, but he's one of many developers who feels it came a little too late. "By the time you get rejected, you've already wasted all the development time and expense," he says, "and there's no recourse to get [the application] accepted." Propelled by bans of high-profile apps like NetShare and MailWrangler, a movement has been growing within the developer community to persuade Apple to use a more open and transparent application process for new iPhone apps. One programmer has suggested appointing an "App Store evangelist" who would coordinate with developers. Others have asked for a pre-approval process that could provide a tentative "yes" or "no" before any major investments are made.